I recently decided to start a new, shorter challenge. I had no intention of doing another one for a long, long time but the prompts for this one are just so cool and different! The challenge is run by a little blog called Moonshine and Sunlight. If you're taking part in this as well go check out her post about it here - it says what to do and where to post your links. You can also see her post for day one here. So, today's theme is "recreate your first nail art, the one you started with." My first blog post was with crackle polish, which doesn't really count as nail art so I checked my second blog post and found that there were two designs there. 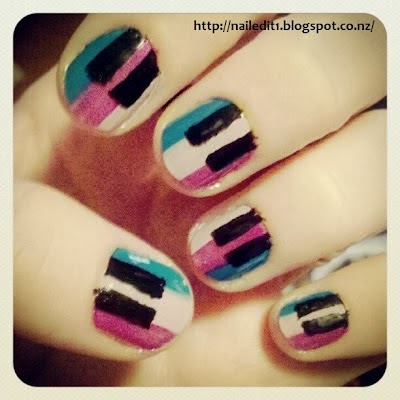 One was dumb, but the second was quite cool - piano nails! I learnt piano for a long time and while I don't play much now, I'm proud that I passed Grade 5 and intend on picking it up again one day when I can afford lessons. Here's my nail art - and my lonely piano! Here's my old design that I recreated. From what I remember, I found the idea for this design from We Heart It, and after a quick search I found that Nail Art Madness first did a variation of this design, which you can find here. I kind of wanted to change the colours to cute pastels, but decided to stick to the same/similar colours to have a better comparison. Even so, they look completely different! The photography's improved a tad too. They're surprisingly tricky, though - it's ridiculous! Trying to get the black keys even remotely square at the bottom is really hard and I felt like such an amateur. It wasn't until I posted this picture on Instagram and my other social media accounts that I realised they were Rasta themed nails. I genuinely didn't even notice that they're the right colours for it. Sure the green's a bit off, but it's pretty close! So these can be Rastafarian pianos. I have intentionally done Rasta nails before, by the way, which you can see here. And here's the left hand. I kinda made the keys too short. One last picture, another of my nails and my piano. I thought it'd be a good way to point out that they actually are meant to be pianos! Now I'll go add my link to Moonshine and Sunlight's post - make sure you do this too if you're doing this challenge! I always wanted to learn piano !